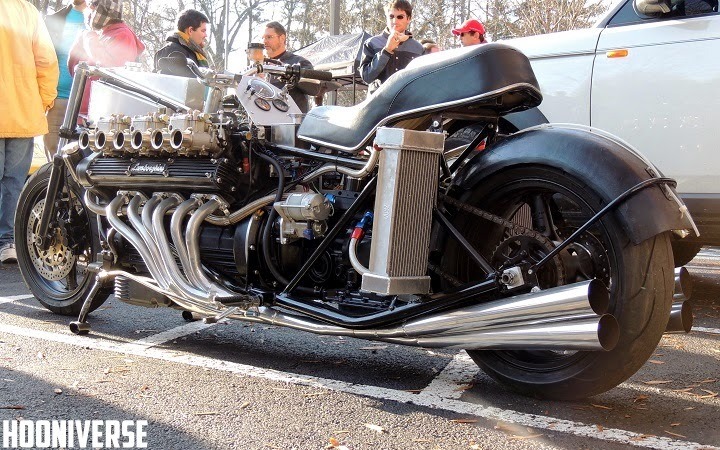 Unbelievably, this bike uses a Lamborghini engine !! It is no secret, if Lamborghini is sport cars with super-powerful force. It is very reasonable, considering the Italian supercar is equipped with the engine that has a capability of spitting out hundreds of horsepower, which is then delivered to the four wheels and also the car design is very aerodynamic to run in high speed. But it seems that the conventional way of working which had been carried by Lamborghini does not apply for a man from Georgia. 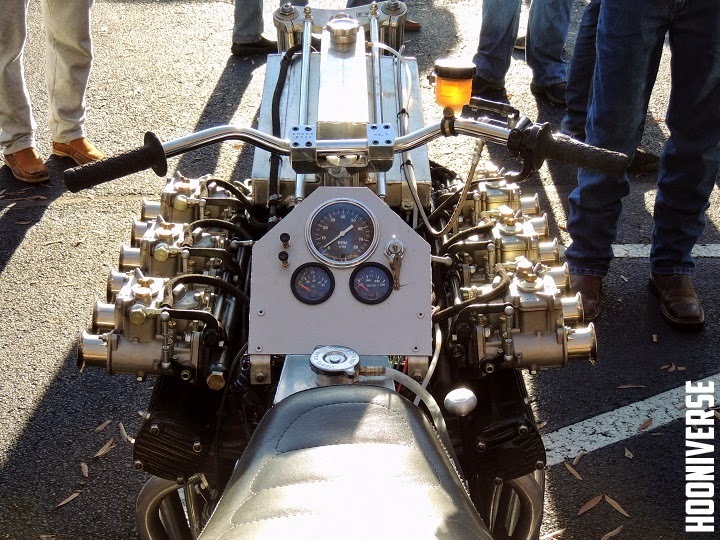 This clearly he showed with various extreme modifications he ever did, one of the most phenomenal is by installing a Lamborghini V12 engine into a custom-made motorcycle. As reported by the Bold Ride, the custom motorcycle is owned by Chuck Beck, who has long been involved in the field of automotive builder and fabricator, but the presence of a motorcycle with the appearance of six neck muffler located on each side of the custom motorcycle which have been shown in the 'Caffeine and Octane' event which held in Alpharetta, Georgia. In a video that was disseminated through You Tube, the owner of the motorcycle powered by Lamborghini engine had a chance to turn on the machine, after it began to open the gas tap. 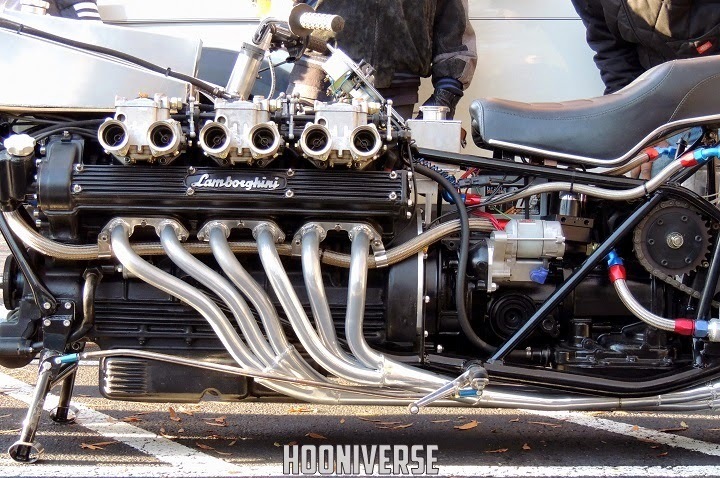 No doubt, once the engine starts, and we could hear the typical loud roar of the Lamborghini's engine, even when the custom motorcycle is still in the idle condition. 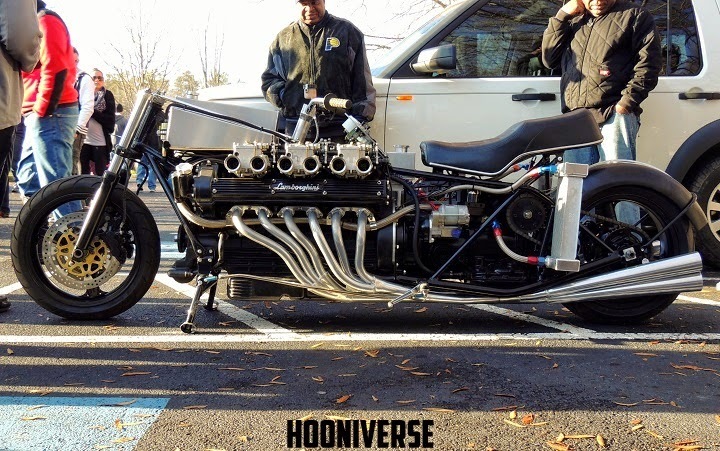 The owner claimed that the custom motorcycle that carrying a Lamborghini engine is functioning properly like motorcycles in general, even he admitted that the custom bike is capable of everyday use. However, this bike rarely used by him, considering the feasibility regulation on the highway it will not be fulfilled.